For the past 15 years PetFinder has been dedicated to helping adoptable pets across the country find new forever homes. Through their partnerships with hundreds of pet rescue organizations, thousands of pets have been adopted. Now in celebration of their 15th anniversary, PetFinder is working harder than ever to get the word out about pet adoption using the resources of the Internet. 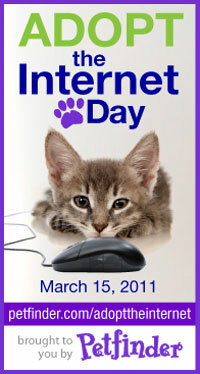 March 15, 2011, is "Adopt the Internet Day" on PetFinder. Visit their site at https://www.petfinder.com/blog/2011/03/help_petfinder_adopt_the_inter/ to see how you can participate in this special event. Visit PetFinder to learn more.